For anyone who follows not just stories but meta-stories—that is, stories about storytelling and how it's evolving—2014 was a pretty big year. Along with twelve months of shootings, bombings, protests, invasions, and epidemics, we've witnessed profound changes in the way journalism and entertainment alike are being presented to us. Some of these developments have been building for years; others came out of the blue. Before we go rocketing into our next revolution around the sun, let's pause for a brief recap. Atop the 700-foot wall of ice in HBO's "Ascend the Wall"
On Tuesday, October 21, I'll be partnering with marketing and communications expert Paul Woolmington to offer a special one-day program in Digital Storytelling Strategy. Co-sponsored by the Columbia University School of the Arts and the Columbia Business School, the full-day session is designed for business executives who need to know how to get their message across in a world in which the way we communicate is being totally redefined. Why is digital forcing a trans­formation in the way we tell stories? How can marketers, producers, and strategic planners lev­erage these changes rather than be left behind? That's what we'll be addressing. 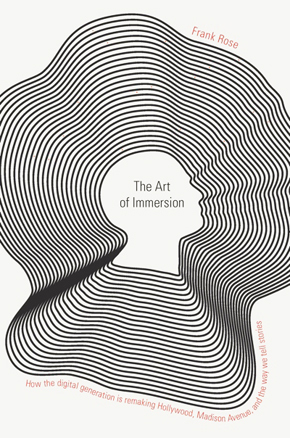 Grammars have rules—so what are the rules that will determine how brands tell their story in the 21st century?Obviously much of this was inspired by The Art of Immersion, the book I published in 2011, but we plan to go considerably further than that. The book was largely anecdotal—a series of stories from movie directors, television producers, game developers and others that sought to describe what I saw as a newly emerging grammar of storytelling for the digital age. Over the past year or so I've been working to develop a much more systematic ap­proach—one that not only reports how narrative is evolving and gives it historical context but explains how we can put it to use. Grammars have rules—so what are the rules we'll use when telling stories in the 21st century? Well, to a large extent they're still being made up. But that's what I'm working on today. Summer is now officially over, and for Hollywood the results were not good. No, the industry didn't suffer a repeat of the string of debacles that hit last year, when one mega-budget picture after an­other—White House Down, The Lone Ranger, Pacific Rim, Turbo, R.I.P.D.—unceremoniously tanked. In fact, the news was actually worse. Can the smartphone really save journalism? Can anything save journalism? Both those questions have been raised in response to my essay in the current issue of Wired. Titled "Immerse Yourself: Why the smartphone means a golden age for journalism," the piece makes the case for the smartphone as a perfect device for getting the news—including the kind of longform journalism once thought headed for extinction. It's a counterin­tuitive argument, which is why it appears in a slot labelled Argument, and it's generated a lot of comment on Twitter, almost all of it positive. But Dan Mitchell, who has written about such issues for Fortune and other publica­tions, wanted to know how I could be claiming a "golden age" when statehouse news bureaus around the country are all but empty. It's a fair question: Newspaper ad revenues have been plummeting for years, and papers have had to cut back severely. And while there are a number of answers, the simple one is this: Journalism and newspapers are not the same. I'm not arguing that all journalism's problems have been solved—far from it. But it's clear that there is a market for serious online reporting, a market that's now making the crucial transition to mobile. Just last month, for example, The New York Times reported that one of The New Yorker's most successful articles online was a 25,000-word report on Scientology, and added that mobile users are among the fastest-growing segments of the magazine's read­ership. This kind of thing is crucial—because where there's a market, there's a way. The Kaltura Hackathon: What's next for video? When Kaltura, the company whose open-source video platform is used by everyone from the World Bank to Columbia Business School to HBO, asked me to be a judge for last week's Video Experience Hackathon, I was quick to say yes. With $50,000 in prize money, it was a sure bet to draw people with some cool ideas. So last Wednesday, on the final day of the annual Kaltura Connect conference in New York City, I sat down with IBM cloud services CTO Mac Devine, Sherpa Digital Media's Ben Chodor, and Zohar Babin of Kaltura to take a look. The hackathon had taken place over a 43-hour period the previous weekend. By the time we got there, the 12 teams that submitted working applications had been narrowed down to four finalists. We were asked to judge them on four criteria: innovation and creativity (how original is the idea? does it offer a real solution in the market? ), polish (does it feel hacked together, or is it well thought out? ), design and user experience, and use of software tools provided by the sponsors—Kaltura, cloud hosting company Rackspace, and automated voice transcription outfit VoiceBase. Behind the savage bloodshed, naked power lust, and epic betrayals that make HBO's Game of Thrones so enthralling to watch are the languages created for the show. The Game of Thrones conlangs—short for "constructed languages"—were developed by David Peterson, the 33-year-old linguist who co-founded the Language Creation Society, an organization based in Orange County, California, not far from Disneyland. Aside from devising Dothraki, the native tongue of the nomadic horselords of Essos, and Valyrian, the family of dialects based on the language of the lost empire of Valyria, Peterson is best known as the linguist and "alien culture consultant" for Syfy's Defiance. So far, however, nothing he's contributed has matched the use of Valyrian in the stunning scene at the finish of "And Now His Watch Is Ended" (season 3, episode 4), when Daenerys Stormborn of House Targaryen—she who hatched the fire-breathing dragons—takes command of the Unsullied, the 8,000 warrior-eunuchs of Astapor, from their slave master, Kraznys. How can we regain control, establish balance, and preserve what makes us human? This is what we will be exploring during this year's Social Media Week. So ends a series of recent posts by Social Media Week founder Toby Daniels on The Next Web. Back in November, Toby asked, "How much power do you have over your tech obses­sion?" (Spoiler alert: Not much, as evidenced by that couple at the next table—we've all seen them—who spend the entire evening gazing into their smartphones.) A couple of weeks ago he asked, "what would happen if we lived with more intention—tried to be more human in this age of digital technology?" And in one of the videos embedded above he explains that this winter's Social Media Week—which begins on Monday in New York and seven other cities around the globe—was designed to examine "the idea that there are two sides to technology: the positive impact of how technology is shaping our lives, but also a negative aspect as well. What we wanted to do really during Social Media Week was to explore both sides of this argument." The big question at the Future of StoryTelling summit: What's the audience got to do with it? Every successful conference puts an idea in play. For me, the second annual Future of Story­Telling Summit was all about rediscovering the audience. During the last century, mass media—news­papers, magazines, radio, television—forced audiences into an increasingly passive and marginalized role. To the extent that audiences mattered at all, it was as consumers—“eyeballs” to be lured to some destination, sorted into demographics, packaged by the thousand, and sold to advertisers. Those days are ending—and one of the most important things we can do is explore the im­plications. Behind the immersiveness trend: Why now? When JWT Intelligence announced its "10 Trends for 2014 and Beyond" recently, trend #1 was "immersive experiences." Certainly you can feel this in New York: From Punchdrunk's Sleep No More (now running for nearly three years) to MoMA's Rain Room to Yayoi Kusama's Infinity Mirrored Room, people are willing to pay top dollar or line up for hours to experience something all-encompassing and beyond the ordinary. But why? The new report—based on a survey of Internet users in the US and the UK, on as­sessments from JWT planners around the world, and on in­terviews with outside observers (myself includ­ed)—lists six key reasons. Interestingly, only two have anything to do with advances in technology or production techniques. The re­maining four stem from broad societal shifts—shifts that are tied to, but in many cases a re­action against, the always-on nature of the digital world.